The original lagoon was built in 1999 for 5 million gallons of storage, approved by the NRCS office. In 2003 when we expanded cow numbers we also expanded our manure storage. Lagoon now has a capacity of 10.5 million gallons, and was DNR and NRCS approved. The extra storage allows us to not haul any lagoon manure on frozen ground, and to not have to haul in the spring of the year, which has tremendously helped lessen our soil compaction, and avoid runoff issues. 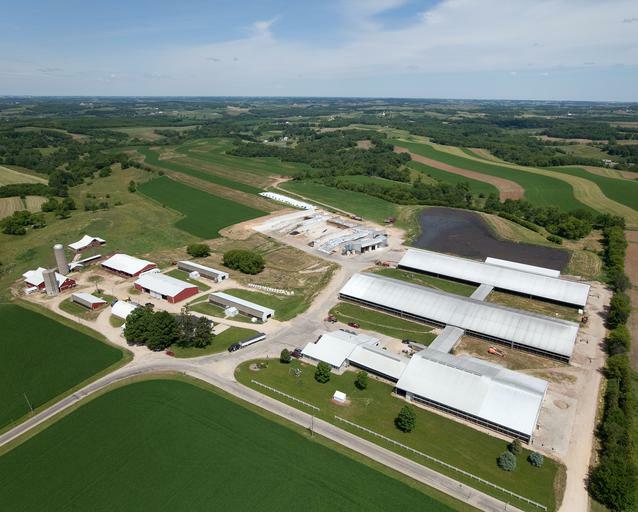 There is an additional 2.5 million gallon lagoon on a farm owned by Majestic View, 5 miles from the dairy. We fill that periodically through the summer to dragline the tillable acres surrounding it in the fall.